On Thanksgiving morning, Pacific Swim Bike Run is co-sponsoring the city of Stamford's first 5k Turkey Trot, which is an organized 3-mile run starting from Fairway market on Canal Street at 8:00am. Participants are also encouraged to bring non-perishable foods – and hats and mittens - to donate to families in need. It sounds like a great event and a nice preemptive strike against the calories most of us are expected to ingest that day. Reading about the Turkey Trot made me think of the link between turkeys and exercise. After all, the most common animal I see when cycling in Fairfield County – after birds, squirrels, chipmunks and dogs wearing sweaters – are turkeys. 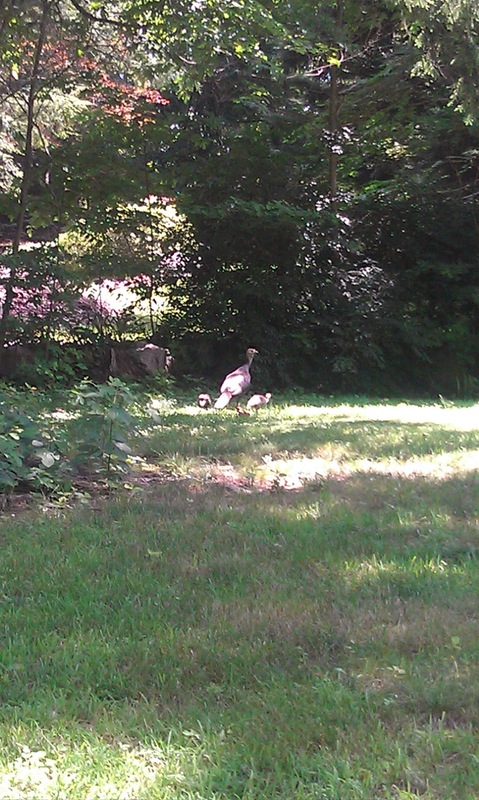 I took a cell phone picture of this adorable family of mouth-watering turkeys a few months back when on a lunchtime ride on Wire Mill Road in Stamford. I've spotted roving gangs of them at the Talmadge Hill Metro North station in New Canaan. I saw a herd in a field when riding in rural Pennsylvania. So yes, I see them more on bike rides than I do on a dinner table. If you're like me, the most calories you usually burn on Thanksgiving are when you dig a hole in your mashed potatoes to pour the gravy in. I know I can't do the Turkey Trot, but I still wanted to do something in the same spirit. Yes, Thanksgiving Day isn't usually associated with exercise, but neither are the days leading up to it. Most people, when shopping for Thanksgiving dinner, just drive to the grocery store, put the frozen turkey in the car trunk, and drive away. So the question becomes: how does one make the activity of buying a turkey more physically taxing? The answer, as you may have guessed: is not this. Right, so what happened is I figured out how to get the trike out of the workshop: I first put in a wooden cargo platform and later removed the seat and carried it sideways up the basement stairs. When I put it back together, I lashed down a cooler. I even added an extra safety measure. I was going to tell you that multicolored duct tape makes a great stocking stuffer, but I only believe in promoting one holiday at a time. I wanted to write a post on a successful ride on the trike to the grocery store for Thanksgiving trappings and back again, but this is not that post. I was fine with the trike's instability. Fine with the stares from motorists. Fine with the creaks and mysterious wobble. I wasn't fine with having to put the chain back on every 1/10 of a mile, so after a half mile I did a defeated ride back. My wife asked what went wrong. “It isn't built well,” I said morosely. My wife assured me I'd find a way to fix it, but I had no interest in doing that today. I still wanted to do my Thanksgiving challenge, and as it happens, I still had an ace up my sleeve. Now, as we learned from last week's episode, the bike trailer has proven itself to be more than capable at moving a couple of bicycles to Domus. I figured it would have no trouble handling a turkey, so I lashed the cooler to it (and left the orange triangle). I couldn't ride my Dahon Matrix as fast as usual, but it still pulled the trailer well. I decided not to go to Fairway and instead headed up to Shop Rite on Hope Street for more of a challenge. After about five miles of avoiding curbs, storm drains and parked cars, I made it to my destination. It felt strange putting my helmet in the front basket of the grocery trolley; I had to keep reminding myself that I had cargo capacity with the trailer. So I raided the aisles for Thanksgiving supplies. Corn, gravy, green beans and a frozen 14 lb. Butterball because I like the fact they have the Butterball Turkey Talk-Line (1-800-288-8372). I also got some pumpkin pie filling and a pumpkin pie crust. I know they get a bad rap but instant potatoes are good. And, of course, I bought jellied cranberry sauce. It's the kind that looks like the can when you put it on the serving plate. I always associate the can-shaped sauce with Thanksgiving. You do too. Admit it. Once I had a full Thanksgiving meal in the trolley I paid for it and left. The orange net I was using as the floor of the trailer looked like it was protesting, but it didn't break when I put everything in in the cooler. Once I lashed everything back into place, I got on the bike and set off. I quickly discovered the turkey was having an effect on the bike's handling (I write a lot of sentences I don't often write since I started this blog) but it wasn't dangerous. The Matrix has excellent brakes and the motorists, mindful of the duct tape triangle, gave me a decent amount of space as I pedaled down Hope Street. I briefly thought about trying to get a donut at the Donut Delight drive through but the line of cars was too discouraging. I rode on. But I didn't ride home. Instead, I rode here. The Food Bank of Lower Fairfield County serves a pretty large area and is always looking for donations, so to keep with the spirit of the Turkey Trot I gave the contents of my cooler to the guys in the back who thanked me for my donation. The thing is, I'm lucky enough to not have to cook Thanksgiving dinner this year. In fact, the whole reason I can't do the Turkey Trot is that I'm going to my aunt's house to join family. I'm thankful and appreciative she and my uncle are hosting and the bulk of the food prep isn't on my shoulders (I think I volunteered to bring cranberry sauce). So, as you can guess, I'm lucky in several ways. I took the trailer and the empty cooler another 14 miles before arriving home, so all in all it was a good challenge. If you want to borrow it so you can bring food to your house or to the food bank, just let me know. If you plan to do the Turkey Trot, don't forget to have fun – and bring a donation. that's how you transported the bikes to Domus? I didn't know. Did we get a picture and post it on our FB page? Where have I been?